I have been reading this question so many times on different forums, blog post etc. " How to load the data to SQL Server Table from File when Columns can change in the source file. Sometime we have less number of columns than Table columns or sometime same number of columns. I have created a post related to above scenario " How to create tables for multiple pipe delimited files and load them dynamically to those tables"
Let's move to this scenario today. To make the SSIS Package more dynamic, I am going to use three Parameters, you can use variables if you are still using old versions of SSIS such as 2005 or 2008/R2. As you can see that we have Source Folder parameter, Table name, Delimiter. So you can use this package to load any files from Source Folder.You only have to provide the delimiter of file and table name in which you want to load the file/s. 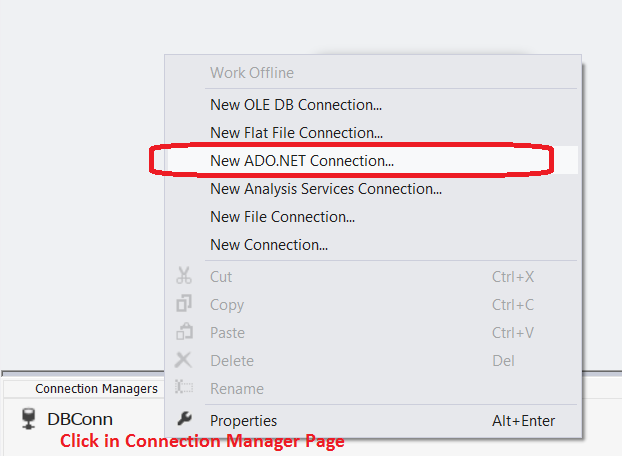 Click in Connection Manager Pane and then Create ADO.NET Connection by providing Server Name and database Name. After creating I have renamed it to DBConn. Bring the Script Task to Control Flow Pane and then open it. I have used C# for scripting. Map the SSIS Variables/Package Parameters as shown below. Click on Edit Script Button and then add below script to Script Task. Replace public void Main with below script. There is a lot more you can do. You can even check the column name exists before you insert and handle that exception. In this code, I am not checking if column name exists or not. So if somebody provide a file with column name which do not exits in table, this script is going to fail. Save the script and close the Script Task Editor. Now you can go ahead and place files in Source directory with different columns. Provide the Table name in which you want to load those files in SSIS Package. Once you will deploy this SSIS Package, you will be using Configuration to change the values for TableName,Delimiter and Source Folder.